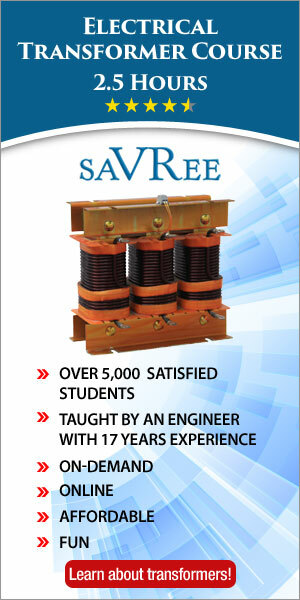 This method of transformer cooling is generally used in small transformers (upto 3 MVA). 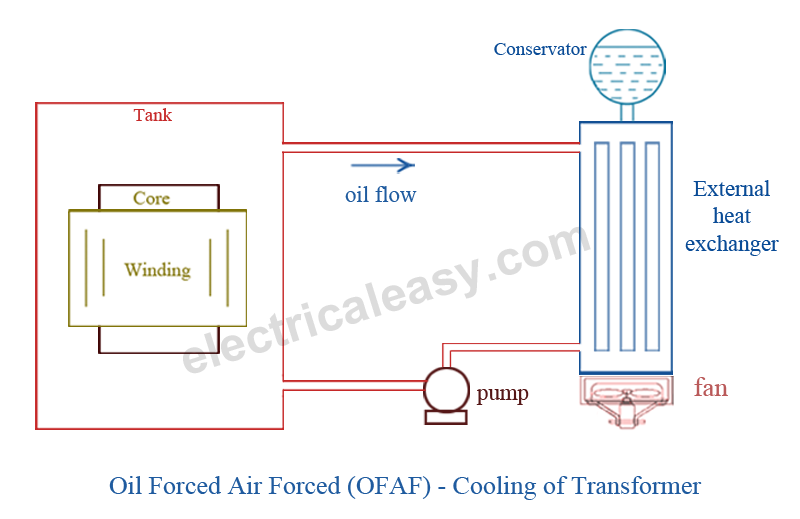 In this method the transformer is allowed to cool by natural air flow surrounding it. For transformers rated more than 3 MVA, cooling by natural air method is inadequate. In this method, air is forced on the core and windings with the help of fans or blowers. The air supply must be filtered to prevent the accumulation of dust particles in ventilation ducts. This method can be used for transformers upto 15 MVA. This method is used for oil immersed transformers. In this method, the heat generated in the core and winding is transferred to the oil. 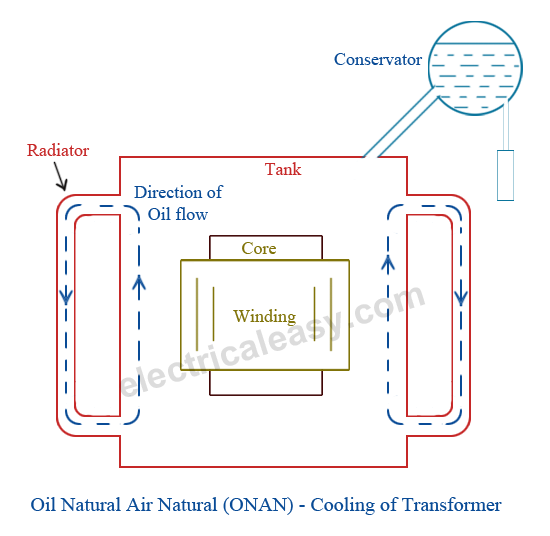 According to the principle of convection, the heated oil flows in the upward direction and then in the radiator. The vacant place is filled up by cooled oil from the radiator. The heat from the oil will dissipate in the atmosphere due to the natural air flow around the transformer. 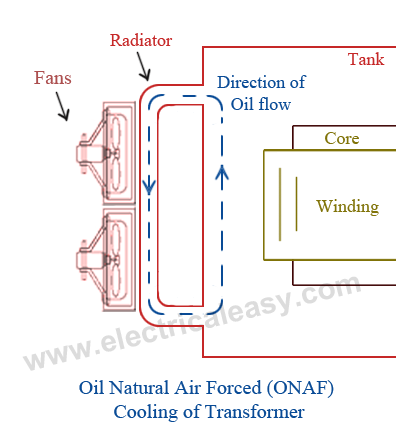 In this way, the oil in transformer keeps circulating due to natural convection and dissipating heat in atmosphere due to natural conduction. This method can be used for transformers upto about 30 MVA. The heat dissipation can be improved further by applying forced air on the dissipating surface. Forced air provides faster heat dissipation than natural air flow. In this method, fans are mounted near the radiator and may be provided with an automatic starting arrangement, which turns on when temperature increases beyond certain value. This transformer cooling method is generally used for large transformers upto about 60 MVA. In this method, oil is circulated with the help of a pump. The oil circulation is forced through the heat exchangers. Then compressed air is forced to flow on the heat exchanger with the help of fans. The heat exchangers may be mounted separately from the transformer tank and connected through pipes at top and bottom as shown in the figure. This type of cooling is provided for higher rating transformers at substations or power stations. 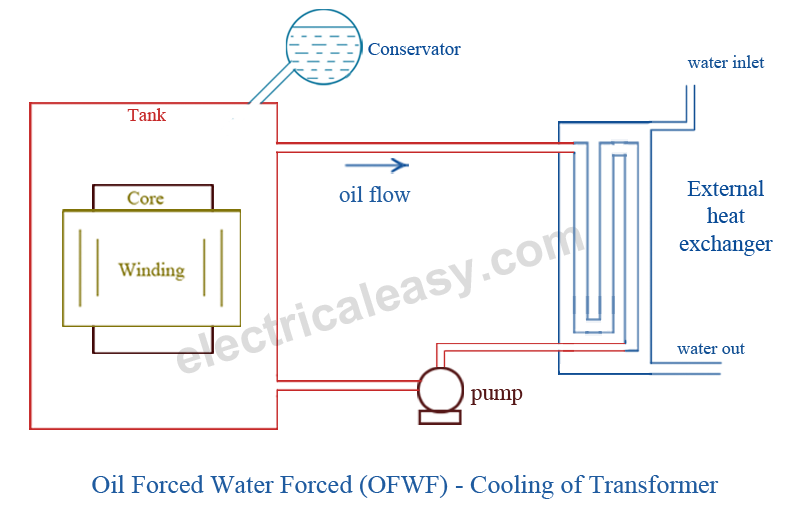 This method is similar to OFAF method, but here forced water flow is used to dissipate hear from the heat exchangers. The oil is forced to flow through the heat exchanger with the help of a pump, where the heat is dissipated in the water which is also forced to flow. The heated water is taken away to cool in separate coolers. This type of cooling is used in very large transformers having rating of several hundreds MVA.